This brush has been chosen as the best sonic toothbrush of 49 brushes put to the test and described as “the best sonic toothbrush that dazzles in the tests with excellent dental cleaning and high-quality processing.” Eliminates up to 7 times more plate than a manual brush. Sonicare Diamond Clean HX9352 04 brushes perform 62,000 movements per minute, is very quiet and has five brushing programs: daily cleaning, gum massager, polishing, sensitive teeth, and whitening. It has a 2-minute timer and an interval timer of 30 seconds. The lithium battery lasts 20 days and has a double charging system: through a charging glass (lovely) and also through the travel case. It includes two spare heads, and the guarantee is two years, and you can find it online on shopping websites. Chosen as the best rotary technology toothbrush and the second best in the general category. Cataloged as “the best Oral-B brush that includes a strong battery and recognition of the position of the teeth.” It performs 8,800 rotations per minute and 20,000 pulsations. It has a 2-minute timer and an interval timer of 30 seconds. It includes a lithium battery that lasts for 12 days and also a travel case, which allows not only to charge the toothbrush but also the mobile phone. Oral-B Genius 9000 accessories include Bluetooth connectivity: you download an application that, among all the features included, is the position detection that allows you to recognize which areas you are brushing, guiding you to cover all areas and thus get a complete cleaning and also save all your information, having your statistics always at hand. An additional feature that is not insignificant is that it allows monitoring in the event of a problem of bleeding gums. A dispensable feature is a possibility of playing games. For example, you earn points if you complete a two-minute brushing. 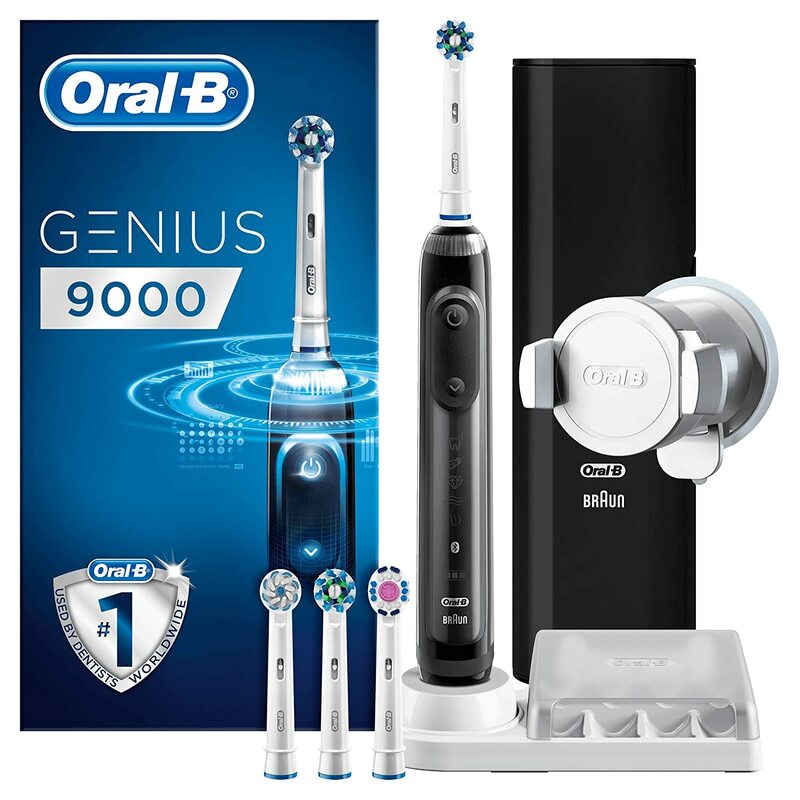 Oral-B Genius 9000 programs offer six brushing programs and has a pressure detector: unlike other models that only emit an alert to notify that brushing is too rough, this brush reduces speed, in addition to informing the user. The application also indicates how to improve your brushing technique, showing you which areas you should brush more smoothly or intensely. Includes wall bracket and four spare heads. Additionally, you can customize the brush with 12 different colors. A 2-year warranty is supplied by the manufacturer. So which is the bestselling electric brush – oral b or sonicare toothbrush? In general electric toothbrushes have been shown to eliminate plaque buildup faster than manual brushes. The Oral-B Smart 4 4900 Electric Toothbrush is the most sought-after electric toothbrush sold in stores in the last year. You get great results with electric toothbrushes since they are carefully calibrated to improve cleaning with the minimum amount of work. Our findings indicate that the most popular toothbrush is the Oral-B, a high-quality rechargeable toothbrush that consistently removes plaque. Happy brushing!